Salal and Oregon grape are two of the most common and recognizable understory plants in our Northwest forests, often living side by side in dense thickets. Yet their culinary charms remain hidden, in a manner of speaking, rarely gracing Seattle restaurant menus or residential kitchens, while other wild foods ascend the popularity charts. I suspect this oversight will change as chefs and home cooks alike continue to think more locally and sustainably about the ingredients in their pantries, especially those ingredients that speak to our region. Salal (Gaultheria shallon) is a shrubby plant, typically waist-high (though sometimes much taller), that grows along the Pacific Coast, from sea level to montane forests. Noted for its shiny green foliage, it’s already being used globally for floral displays. But salal deserves a place at the table—and not just in a vase. The fruit, a string of dark blue, nearly black pearls that hang neatly in a row, ripens in late summer. Many a hiker is familiar with their blackberry-like flavor and distinct, unusual note of earthiness, and with a little processing at home they can be so much more than a trailside snack. Historically, salal berries were important to Native Americans across the Pacific Northwest. They dried the vitamin-rich fruit, high in antioxidants, and mixed it with preserved meat, such as smoked salmon or venison, to make a densely nutritious food known to 19th-century white trappers and settlers as pemmican, the original PowerBar. These days, drying still remains an excellent option. You can use a mortar and pestle (or food processor) to mash up salal fruit, releasing its natural sugars, and then sweeten it even more with honey, if desired. Spread the mixture on waxed paper and use a food dehydrator to make a tasty all-natural fruit leather. Like salal, Oregon grape (Mahonia sp.) is a ubiquitous understory plant in our conifer woods, with varieties that range from ankle-high to well overhead. Shiny green leaflets resemble holly and are noticeably spiny. The clustered berries are deep blue and much more astringent than salal, but with a little processing they can be transformed into something special. My preferred way to handle both the fruits of salal and Oregon grape is to extract their juice, which can then be sweetened or spiced for sauces, syrups and jams. I’ll harvest a bucket full of the berries, cover them with water (barely) in a large pot, and simmer until softened enough to run through a food mill (an old-fashioned yet very useful hand-cranked kitchen gadget that removes the seeds and skins, and sieves the resulting mash). Once the liquid is extracted, you can decide what to make. A sweet syrup for desserts? Add some sugar and maybe cinnamon or cloves. A savory sauce to serve with game or fish? Cook down with chicken stock, a splash of wine or port and fresh garden herbs. Combine both salal and Oregon grape for a flavorful jam that’s also quite nutritious and tastes a lot like Concord grape jelly. Sometimes my kids get PB&J sandwiches in their school lunch boxes and they don’t even realize the “J” is wild from a patch of nearby woods. Photograph by Langdon Cook; A bowl of salal berries ready to be made into syrup. Go out and pick some salal or Oregon grape over Labor Day and make a memorable syrup for dessert or adult beverages. 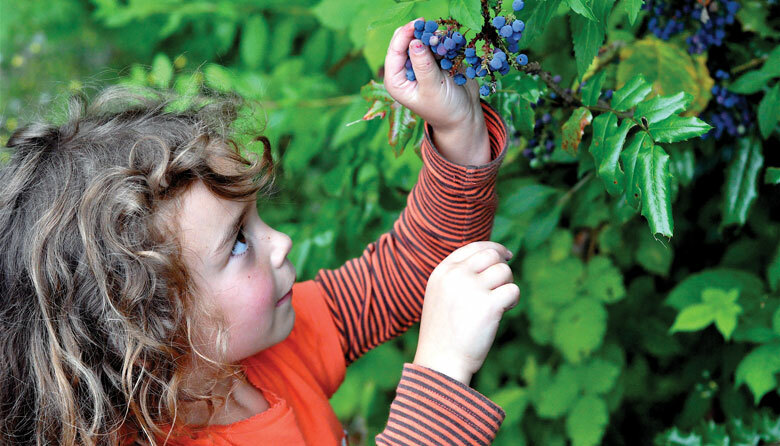 Salal is naturally sweeter than Oregon grape, so adjust sugar accordingly and to taste. Put several cups of fresh, de-stemmed fruit of salal or Oregon grape in a pot and add just enough water to cover. Simmer until soft and juicy, about 30 minutes. Run mixture through a food mill, reserving juice. Heat 2 cups of juice in a sauce pot over medium heat. Add sugar and lemon and stir until thickened, tasting and adjusting as you go. Pour into sterilized jars and refrigerate for up to 3 months, or seal lids and process in hot water bath for 10 minutes for longer storage.